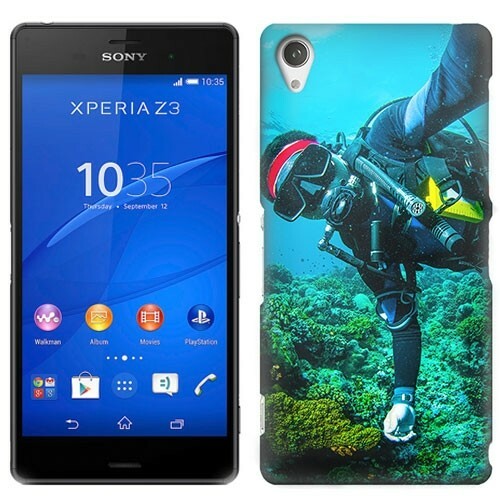 Personalise your own Sony Xperia Z3 full wrap case. It's simple. Pick a photo or design and upload it. We will print a high quality case for you to protect your phone. A full wrap case for a great phone! The Sony Xperia Z3 is a great phone that has a unique, sharp edged design. This device needs a case that truly respects is design features. This is why GoCustomized has developed the Sony Xperia Z3 full wrap hard case. This case not only offers your device its much needed protection, but also ensure that its design features are not covered in by a bulky case. What makes this case even more special, is the full wrap print. Full wrap printing means that your design will be printed not only on the back of the case, but also on sides! Design the case however you please! Our designer module is very easy to use. Start by uploading an image to the module from either any of your personal devices or your Facebook & Instagram accounts. Make sure that the image you use is of the highest possible quality you can find. The better the quality of the image used, the better the end result will be. If you lack inspiration, check out some of our pre-made designs. All our pre-made designs are made by our in house designers. Once you are done designing your case, you can add a little personal text to finish it off. There are plenty of fonts and colours to choose from. Enjoy! The production and shipping of your case.